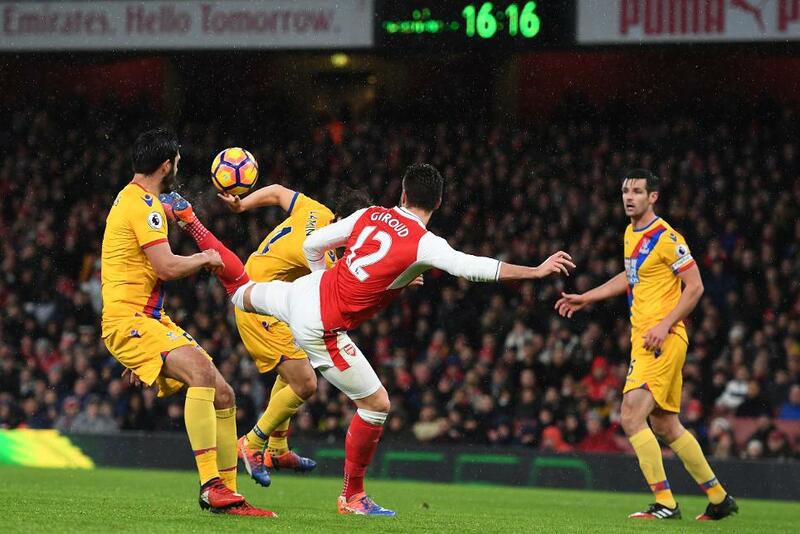 Olivier Giroud scored a goal-of-the-season contender as Arsenal beat Crystal Palace 2-0 at Emirates Stadium. On his second start of the Premier League campaign after his winner against West Bromwich Albion, the Frenchman netted with an astonishing flick from Alexis Sanchez’s cross to rival Henrikh Mkhitaryan’s similar effort for Manchester United in Matchweek 18. Sanchez twice went close to making it 2-0 before Alex Iwobi headed in Nacho Monreal’s deflected cross for his second goal of the season 11 minutes into the second half. Palace rallied and tested Petr Cech through Christian Benteke, Yohan Cabaye and Andros Townsend, but the Gunners were deserved victors to move back above Tottenham Hotspur into third place.